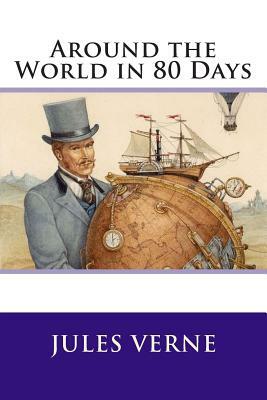 Around the World in Eighty Days is a classic adventure novel by the French writer Jules Verne, published in 1873. In the story, Phileas Fogg of London and his newly employed French valet Passepartout attempt to circumnavigate the world in 80 days on a 20,000 wager (roughly 1.6 million today) set by his friends at the Reform Club. It is one of Verne's most acclaimed works. The story starts in London on Tuesday, October 1, 1872. Fogg is a rich English gentleman living in solitude. Despite his wealth, Fogg lives a modest life with habits carried out with mathematical precision. Very little can be said about his social life other than that he is a member of the Reform Club. Having dismissed his former valet, James Foster, for bringing him shaving water at 84 F (29 C) instead of 86 F (30 C), Fogg hires a Frenchman by the name of Jean Passepartout as a replacement. At the Reform Club, Fogg gets involved in an argument over an article in The Daily Telegraph stating that with the opening of a new railway section in India, it is now possible to travel around the world in 80 days. He accepts a wager for 20,000 (equal to about 1.6 million today) from his fellow club members, which he will receive if he makes it around the world in 80 days. Accompanied by Passepartout, he leaves London by train at 8:45 P.M. on Wednesday, October 2, 1872, and is due back at the Reform Club at the same time 80 days later, Saturday, December 21, 1872.